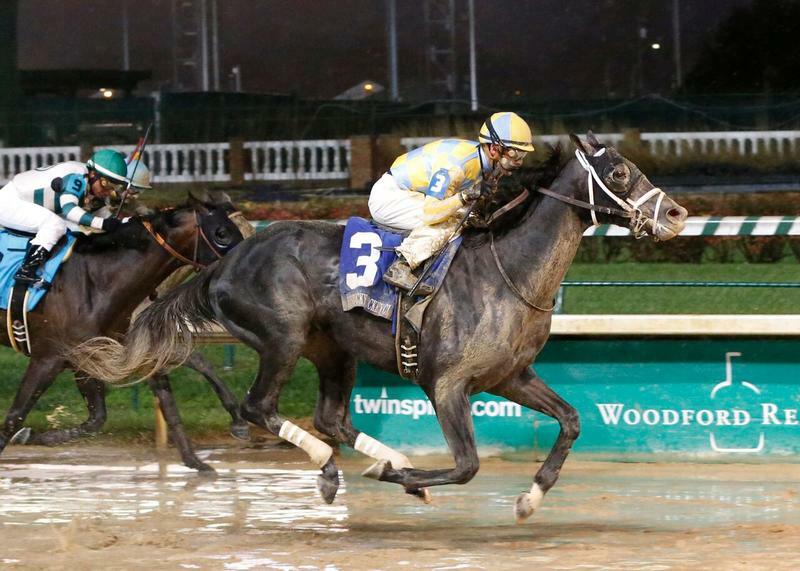 John C. Oxley's Airoforce made a splashy debut on dirt when he skipped over a sloppy track under jockey Julien Leparoux to win the $200,000 Kentucky Jockey Club (GII) for trainer Mark Casse on "Stars of Tomorrow II" at Churchill Downs (Reed Palmer, Churchill Downs). Memorable on-track performances by veteran Effinex in the141st Clark Handicap Presented by Norton Healthcare (Grade I) and rising 2-year-olds in a pair of popular “Stars of Tomorrow” programs; meet-leading efforts by familiar faces in contests for top owner, trainer and jockey; increased race purses and strong wagering and solid on-track attendance combined to create good memories and encouraging results from the 2015 Fall Meet at Churchill Downs Racetrack that ended its 21-day run on Sunday, Nov. 29. 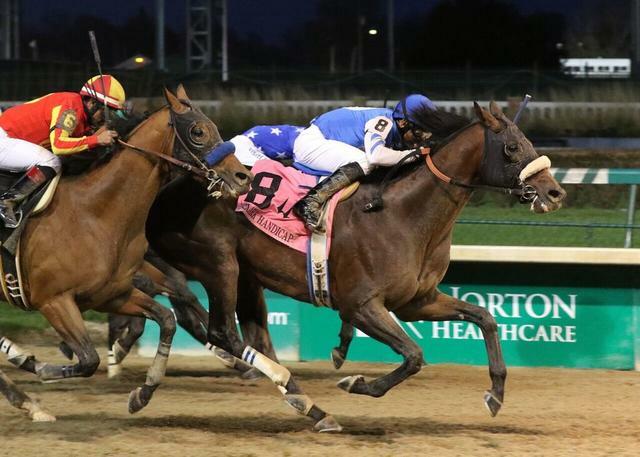 Tri-Bone Stable’s New York-bred Effinex and Hall of Fame jockey Mike Smith held off Karl Watson, Mike Pegram and Paul Weitman’s defending winner Hoppertunity to win the 141st running of the $500,000 Clark Handicap for 3-year-olds and up – the highlight of the popular Nov. 27 “Black Friday” program during Thanksgiving Weekend. The Jimmy Jerkens-trained Effinex was coming off a runner-up finish to Kentucky Derby Presented by Yum! Brands (GI) and Triple Crown winner American Pharoah in his previous start, the $5 million Breeders’ Cup Classic (GI) at Keeneland. A blanket top-five finish in the Clark also included 88-1 longshot Looks to Spare (third), Travers (GI) winner Keen Ice (fourth) and Fayette Stakes (GII) winner Race Day (fifth). Effinex won the historic race by three-quarters of a length, and fewer than two lengths separated its top five finishers. Future stars that sparkled in the Fall Meet’s races for 2-year-olds included John C. Oxley’s Airoforce, the Mark Casse-trained winner of the $200,000 Kentucky Jockey Club Presented by TwinSpires.com (GII), a “Road to the Kentucky Derby” points event on the Nov. 28 “Stars of Tomorrow II” program devoted to races for juveniles; Three Chimneys Farm’s Carina Mia, a daughter of Malibu Moon who rolled to a 4 ¼-length victory over previously unbeaten Stageplay, winner of the $80,000 Rags to Riches Overnight Stakes on the Fall Meet’s opening day, in the $200,000 Golden Rod Presented by TwinSpires.com (GII); and G M B Racing’s Mo Tom, a son of first-year sire Uncle Mo who won the $80,000 Street Sense Overnight Stakes on opening day and finished third for trainer Tom Amoss in the Kentucky Jockey Club. The Nov. 1-29 Fall Meet, the 126th autumn racing session in the track’s 141-year history, also featured strong results in wagering and attendance categories following 2014’s weather-shortened 24-day Fall Meet that lost two racing days to a frozen main track. Large and competitive race fields, a strong stakes program and favorable weather led to an increase in total wagering compared with last year’s 24-day session. Despite three fewer race days, total mutual handle during this year’s meet was $104,626,990, an increase of 9.9 percent from the 2014 total of $95,225,065. Average daily wagering rose 25.6 percent to $4,982,238 from the 2014’s daily average betting of $3,967,711. Churchill Downs ran 27 fewer races over 21 racing days in 2015 than during last year’s 24-day Fall Meet, but total purses paid during the just-completed meet rose 14.7 percent to $9,882,559 from 2014’s total of $8,617,939. Daily purses for the 2015 Fall Meet averaged $470,598, an increase of 31.1 percent from last year’s daily average of $359,081. The average purse for the 223 races conducted during the just-completed meet was $44,315, an increase of 28.6 percent from the average of $34,472 for the 250 races in the 2014 session. Average starters-per-race during the 2015 Fall Meet was 9.41, an increase of 10.3 percent from last fall’s average of 8.53 runners. Total on-track attendance for the Fall Meet, with three fewer racing days than a year ago, dropped 9.2 percent from 113,951 to 103,483. But daily average attendance rose slightly to 4,928, a 3.8 percent increase from 2014’s daily average crowd of 4,748. “Our Fall Meet was a joy for our on-track fans and those who wagered online via TwinSpires.com or other platforms, and the meet’s strong and competitive race fields, favorable weather and successful renewals of our traditional Thanksgiving Weekend racing and entertainment events combined for a memorable 21 days at Churchill Downs,’ said Kevin Flanery, president of Churchill Downs Racetrack. “We deeply appreciate the support of the Fall Meet and our racing product throughout 2015 by horsemen at Churchill Downs and throughout the region, along with the owners and trainers who shipped horses to Churchill Downs from around North America for our stakes events and ‘Stars of Tomorrow’ days. We thank all owners and trainers for selecting Churchill Downs racing from the varied competitive options in the marketplace, and we look forward to welcoming them again for our three race meets in 2016. The human races during the just-completed Fall Meet were all won by familiar and accomplished faces. Ken and Sarah Ramsey extended their record for “Leading Owner” titles at Churchill Downs to 25 as horses carrying their familiar red-and-white silks won nine races from 46 starters. Midwest Thoroughbreds Inc. was the runner-up in the category with six wins from 19 starters, and Calumet Farm, Maggie Moss and Tom Durant tied for third with four victories apiece. The second-place finish by Midwest Thoroughbreds Inc., owned by Richard and Karen Papiese, completed a very successful meet in which the stable’s horses had a record of 6-3-5 from only 19 starters – a 74% in-the-money rate. Steve Asmussen collected his record-extending 17th “Leading Trainer” crown with 11 victories, three more than second-place Chris Richard. Asmussen earned his seventh Fall Meet title and first since 2011 by saddling 13 winners from 47 starters. Mike Maker and Brad Cox tied for third at nine wins each, while Dale Romans and Ron Moquett each saddled six winners. Asmussen earned a stakes victory during the meet with Mike Rutherford’s homebred Stageplay, who won the $80,000 Rags to Riches. 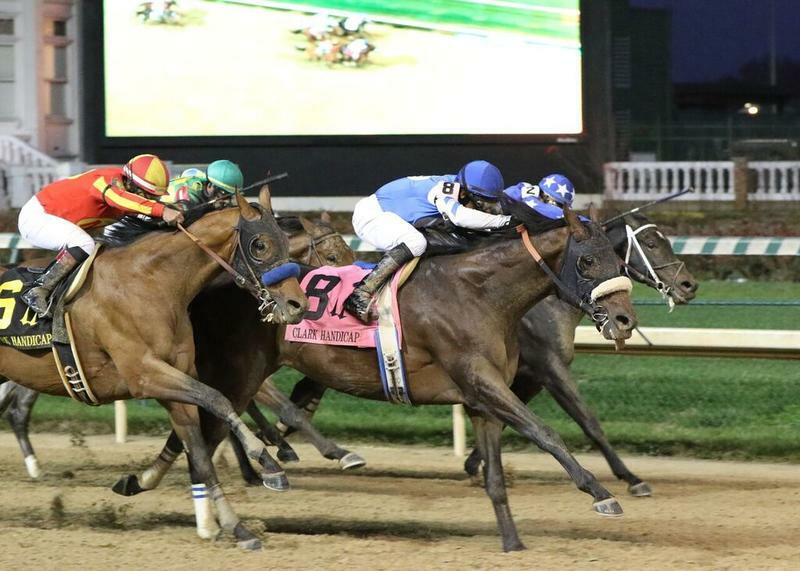 The Louisville-born Cox enjoyed his best Churchill Downs meet as his horses compiled a record of 9-4-5 from 25 races that included stakes triumphs in the $200,000 Chilukki (GII) with Sea Jay Racing’s Spelling Again and $100,000 Commonwealth Turf (GIII) with Rupp Racing Wentworth Brochu LLC’s former claiming horse Almasty. Hall of Famer Bill Mott, the all-time leader in both wins and stakes victories by a trainer at Churchill Downs, added to the latter category when Carina Mia took the Golden Rod in her stakes debut on Nov. 28. Mott trainees have now won 90 stakes events beneath Churchill Downs’ Twin Spires. 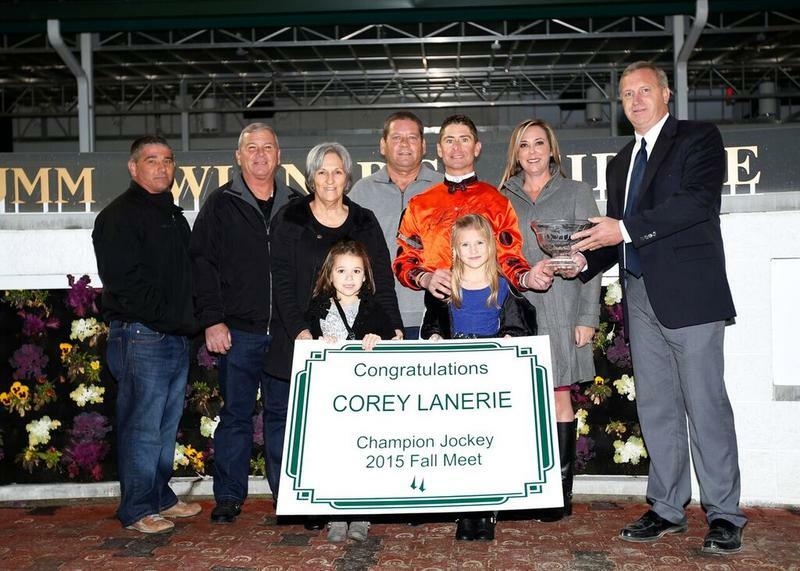 Corey Lanerie continued a remarkable run atop the talent-laden jockey colony when he piloted 33 winners in a runaway performance that earned the Louisiana-born rider his 10th “Leading Jockey” title at the track. The overall total includes a streak a sweep of Churchill Downs Spring, September and Fall Meet crowns and a string of eight consecutive titles. Only Hall of Fame jockeys Pat Day, Churchill Downs’ all-time win leader with 34 local riding titles, and Don Brumfield, with 12, have earned more meet-leading riding totals than Lanerie. Ricardo Santana Jr. finished second among Fall Meet jockeys with 21 wins, three more than the totals for Julien Leparoux and Robby Albarado, who tied for third. Brian Hernandez Jr. was next with 16 wins. Sophie Doyle enjoyed her best Churchill Downs meet and finished with six wins to be the Fall Meet’s top female rider, and Sebastian Saez was the meet’s top apprentice jockey with three wins. Leparoux won three stakes events during the meet. Other notable Fall Meet equine performances included wins by Stoneway Farm’s Ahh Chocolate for veteran trainer Neil Howard in the 100th running of the $200,000 Falls City Handicap Presented by TwinSpires.com (GII) on Thanksgiving Day; Sienna Farm LLC’s Isabella Sings, winner of the $200,000 Mrs. Revere (GII) for 3-year-old fillies on turf; Greenwood Lodge Farm’s Canadian invader Button Down (GB) in the $100,000 Cardinal Handicap (GIII); Terry Hamilton’s Heart to Heart in the $100,000 River City Handicap (GIII); and $80,000 overnight stakes success by Bagg O’Day in the Bet on Sunshine and Robert Baker and William Mack’s Super Sax in the Dream Supreme. There were 171 claims during the Fall Meet that totaled $3,036,500 and generated $182,190 in taxes for the Commonwealth of Kentucky. Live racing will return to Churchill Downs with its 38-day 2016 Spring Meet, scheduled to run from April 30-July 1. The opening of that meet launches the 142nd year of racing at the track that opened as the Louisville Jockey Club in 1875. Three of its races – the Kentucky Derby Presented by Yum! Brands (GI), the Longines Kentucky Oaks (GI) and the Clark Handicap have been run annually and without interruption since the track’s inaugural meet.